"You're bouncing off the atmosphere." Early in director Damien Chazelle's First Man, this is one of the cautions given to Neil Armstrong (Ryan Gosling) during his pilot training, years before he walked on the moon. That idea of the barrier between Earth and space, the violence of making the journey through it and the almost mystical experience of being on the other side of it forms the spine of the film. We encounter Armstrong at three points: 1961, leading up to the start of his training as an astronaut; 1965, just before his first space flight; and 1968, as he prepares to be the first person to walk on the moon. His family life progresses alongside his much more famous professional one: the loss of his two-year-old daughter from brain cancer, the grief that nearly consumes him after, the sacrifices that his service demands from his wife, Janet (Claire Foy), and his relationship with his two boys, to whom he hesitates to explain the dangers of space travel. It makes all the sense in the world that this screenplay is written by Josh Singer, who has screenwriting credits on Spotlight and The Post and, long ago, The West Wing. Singer seems drawn to stories that often make up a certain American integrity narrative — the noble presidency, a justice-seeking press, and here, the moon landing. But while those pieces favor high drama in their declaration of principle, this one is a little quieter. It shows streaks of rah-rah nostalgia for a terribly troubled age with not a lot of discussion of what made it so troubled (save for a reading of Gil Scott-Heron's "Whitey On The Moon"). But Gosling's version of Armstrong is intriguingly turned inward, deeply feeling but outwardly passive. This comes up first in his relationship with his daughter, with whom he is warm and affectionate, far from the distant '50s and '60s dad often drawn in popular culture as a symbol of regressive and emotionless ideas about masculinity. This despite the fact that his work requires — as we learn in the opening sequence — an almost impossible level of detached poise as his cockpit shakes and bangs and gives every indication that it is about to blow apart. Chazelle shoots the cockpit scenes with claustrophobic disorientation, so that the clanging and banging and vibrating is all that exists in the small spaces astronauts inhabit. You see a similar setup several times in the film. The technique creates a sharper sense of the violence — and therefore the risk — of space flight. It's impossible to watch these scenes and not wonder whether these men are doing something that they are not meant to do. The wonder of all this, as it were, is not an abstract concept of the grandeur of space, or at least it is not only that. It is that we are more than obviously not designed to pass through this barrier, except in that we are designed to find ways to do unlikely things. Astronauts, and the many many many many people who support them, suppress every natural instinct that tells you that when you are vomiting and shaking and everything in your ears is roaring and there's no air to breathe, you stop going wherever you are going, and you go back where you came from. That understanding informs the film's idea of Armstrong as a man who, both changed by grief and committed to flight and to duty, can take enormous risks to explore space, but must be forced by his wife to face his young sons and explain those risks. There are risks and there are risks. Foy's character is unavoidably secondary to what we might call the HGM (Historically Great Man) to whom she is married. But she carries a significant piece of the emotional weight of the story. Her husband doesn't always understand that Janet sits and listens to the radio when he's on a flight, just in case he dies. He doesn't initially grasp the burden on her of being responsible for managing their sons' anxieties. There's an excellent sequence in which the administrators at NASA decide that in a dangerous situation, the best thing to do is just turn off the radio so families can't listen — which, obviously, is an absurd miscalculation if the idea is to reduce worry. Foy drives the scene with her balanced presentation of Janet's understanding of command and her expectations as a person who also serves. Structurally, the film leads up to Armstrong's walk on the moon. But it leads to that moment tonally as well. The peace and silence of that sequence underscore that on the other side of this historically difficult barrier to cross was an end to the shaking and banging and defiance of every sign of ... well, doom. This is hope, really; not just the hope of space travel, but every hope. Your capsule shakes, the air roars, you even risk your life, all because maybe there is something on the other side that nobody has ever seen before. And maybe over there, you stop shaking. 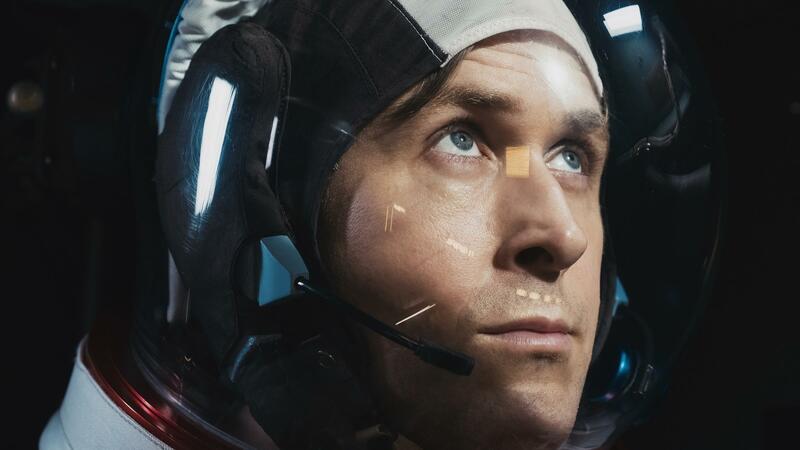 First Man does romanticize space travel and some of the iconography of the Historically Great Man (and, as critic Yolanda Machado has noted, its vision of NASA in the 1960s seems awfully white, even for NASA in the 1960s). But the imagery of a struggle against an unforgiving onslaught of heat and hazards, and against the forces that constantly try to return you to your place, is effective. Whether it's grief or gravity you fight, those battles are won only with great steadfastness and support — and the hope that they will end in peace.